I don't think I've ever reviewed a book with such a tightly focussed audience before. 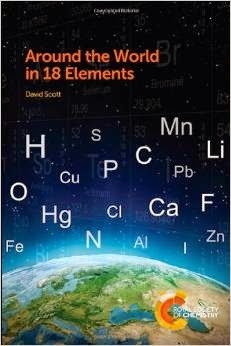 If you are doing A-level chemistry or perhaps are in the first year of a chemistry degree (and I say that as someone who did chemistry A-level and the first two years of a chemistry degree), the book will be a genuine delight. But for anyone else it may prove a challenging read. At first sight, what the reader gets is a more detailed equivalent of the Royal Society of Chemistry podcast series Chemistry in its Element, featuring the history, nature, uses and oddities of, in this case, 18 of the elements. There is a lot more here than there is in the podcasts on the actual chemistry of the selected mix of nine metals and nine non-metals - so, for instance, on sulfur we stray into alchemy and the earth's crust, sulfuric acid, sulfates, thiosulfates, organic sulfur and the mysterious hydrothermal vents. Q1. Assign an oxidation number to sulfur in each of the following compounds: SO2, SO3, H2S, (CH3)2S, (CH3)2SO, FeS, FeS2 and CaSO4.2H2O. It might seem that it would be easy enough to skip over the questions, but it really isn't, and as they occur on pretty well every page they take up a significant portion of the book. So, should you fit in that very tight audience (or if you are someone who teaches at this level), this is a book that could well make chemistry significantly more approachable and meaningful, making the title very much recommended. But for the rest of us, it's probably not likely to be a worthwhile addition to your collection.